Attend Gallery Night /Awards - Check back soon for updated information! 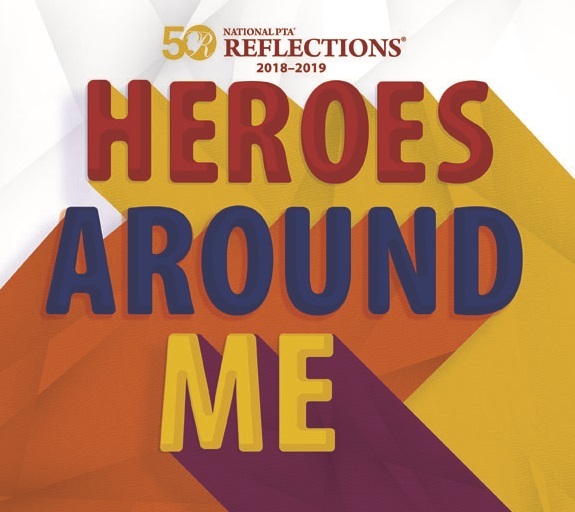 The 2018-19 theme is "HEROES AROUND ME". Enter in one or more of the following arts categories. Puesta del Sol’s 2018 final deadline is Friday, November 16th. Be sure to review the specific artwork submission rules and guidelines outlined in the links below. Entries must be the work of one student, be new, original and inspired by the theme. They should not be something created in a class or with the assistance of an adult. The entry rules must be followed in order for the entry to be eligible for both the Reflections competition and Academic Challenge credit. Entries not following the rules will be disqualified. This ensures that the spirit of both programs remains intact. Complete the Official Entry Form and place it in a page protector. The top portion should show Puesta del Sol information. Complete from a laptop or desktop computer, mobile devices do not handle the entry form correctly. Attach to the back of Visual and Photo entries. Attach to a manila envelope containing a USB/DVD/CD with the Music, Film or Dance file or a copy of your Literature entry. Complete the Puesta del Sol Online Registration to generate judging sheets and ensure Academic Challenge credit. You may order board backing and a sleeve ($5) to assist with submission of entries in the Visual Arts category. Label your entry on the back. No names on the front, cover sheets, title or credit screens. Reflections uses blind judging. Turn in the project and form to the office on Tuesday, November 13th for review. Final due date is Friday, November 16th. No exceptions. Volunteer arts and education experts review submissions without knowledge of the entrants’ identity. These judges are from the community and are not associated with Puesta del Sol. Judges are instructed to look for personal interpretations on the program theme that best exemplify creativity and technical skill. Remember that the Artist Statement is an important part of your entry. In your artist statement, tell us about your work and what it means to you. Twenty-five entries will be chosen as finalists and move on to the Bellevue PTSA Council competition. These winners will be announced by the end of November. Official Entry Form - NOTE: The top portion should show Puesta del Sol information. Complete from a laptop or desktop computer, mobile devices do not handle the entry form correctly. Return to the main PTA Programs page.